Reed is an instructor at the University of Massachusetts, co-author of the ADA’s most recent position paper on vegetarianism, editor of the newsletter for the ADA’s vegetarian group, and also the nutrition expert at the Vegetarian Resource Group. I’ve worked with her over the years on many projects including papers on vegan diets for children, a textbook on vegetarianism for dietitians, and the ADA’s position paper. She is among my handful of go-to experts regarding vegan nutrition, and is widely regarded among vegan dietitians as one of the world’s leading experts in this field. And she is probably THE world’s expert on vegan nutrition in pregnancy and for children. That’s why this book is such an important new resource for vegans. It’s a comprehensive, but reader-friendly guide that covers all aspects of pregnancy and delivery, not just the ones that pertain to diet. Issues addressed in this book include meeting nutrient needs, choosing supplements, eating safely while camping, dealing with skeptical family members, writing up a birth plan, being vegan in the hospital, and feeding a newborn. Pregnant women are likely to encounter health professionals who don’t understand vegan diets and have concerns about them. I think this book will reassure women, their families, and their health care providers that a vegan diet is a safe and healthy choice for pregnant women. 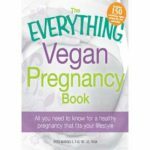 If you know anyone who needs it, please point them toward The Everything Vegan Pregnancy Book. It almost makes me want to have another vegan pregnancy. 🙂 So glad to see a new book on the shelves from a reliable source for vegan pregnancies. I’ll have to add it to my library for loaning out to new moms. 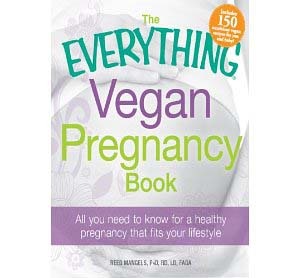 What a wonderful resource, It makes me excited to see such great information on the shelves for expecting vegan mothers. Moms going through vegan pregnancies now have another wonderful reference to point out to others who question their choices. What a gift! How timely. I just ordered this book last night. I’m so excited to finally see a book about vegan pregnancy. I can’t wait to read it. I bought the book after reading this review (I’m currently 16 weeks pregnant) and frankly, I didn’t really like it. I have however found the recipes at the end of the book really good: few ingredients, easy to find in any shop and quick to whip together. I liked the book “The vegan pregnancy survival guide” by Sayward Rebhal much more informative and nice to read.